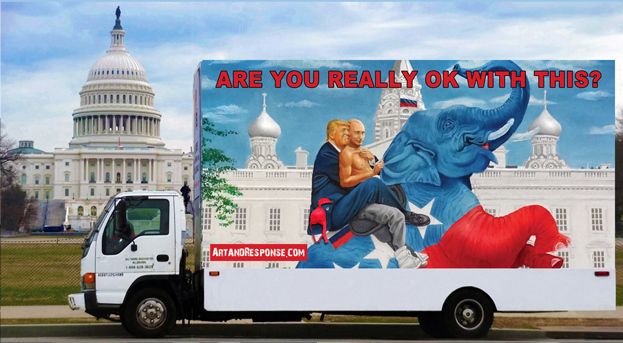 For one week in May, I had three mobile billboards circle the Capitol Building with my art and message to the GOP to put country before party. See the video here. The response was so positive I have created a GoFundMe campaign to take the trucks to other cities around the country. As you can see from the video, people are upset that the Republicans in DC are ignoring Trump’s impeachable offenses and even obstructing investigation to shield their party leader from justice rather than protect our elections and our democracy from Russia. That same concern is what inspired me to take these trucks to DC. I hope to raise enough funds to take these trucks to swing states before the midterm elections.